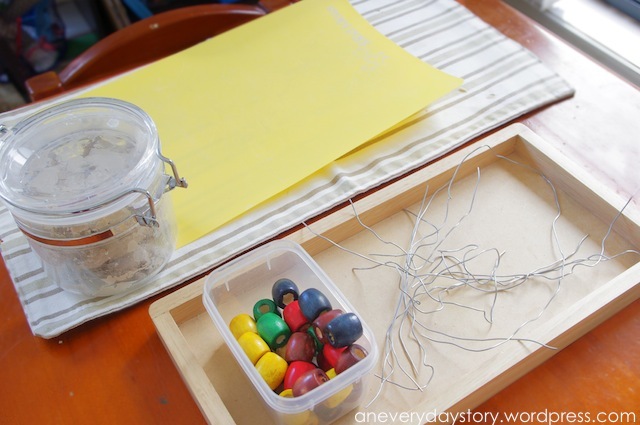 Jack attends a Reggio-inspired playgroup and will soon be starting at a local independent Reggio-inspired preschool. One of the first things I noticed when we started at the playgroup was the wealth of art materials available to the children; watercolours, oil pastel crayons, acrylic paints, tempura paints, big brushes, little brushes, calligraphy brushes, flat brushes, paper of all shapes and sizes, transparent paper, cardboard, every collage material you could imagine…and clay. There is always clay. Clay is often used with other materials like wire, mosaic tiles, natural materials and mirrored tiles. 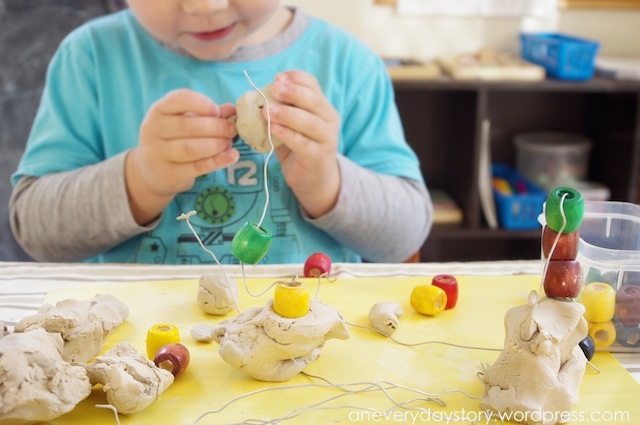 Before we started at the Reggio-inspired playgroup, Jack hadn’t used clay before. We had playdough, but never clay. He really enjoys working with it. When I first introduced clay, Jack wasn’t quite sure how to use it. It didn’t move the same way playdough did. It took about a week of making cupcakes and sausages before he started to pinch pieces off and manipulate it to create different sculptures. Jack is still learning how to interact with the clay; mostly using a second material to sculpt the clay in some way. I haven’t introduced building with clay yet or sculpting by removing clay from a larger piece. These skills will come in time. At the moment he is enjoying making his sculptures. Recently I noticed that Jack was enjoying playing with Sarah’s bead roller coaster. This morning I asked him whether he would like to make his own roller coaster using clay. YES! So with a simple set up; clay, wooden beads and some beading wire, Jack set about making his roller coaster. Jack’s use of the clay is becoming more refined and purposeful. 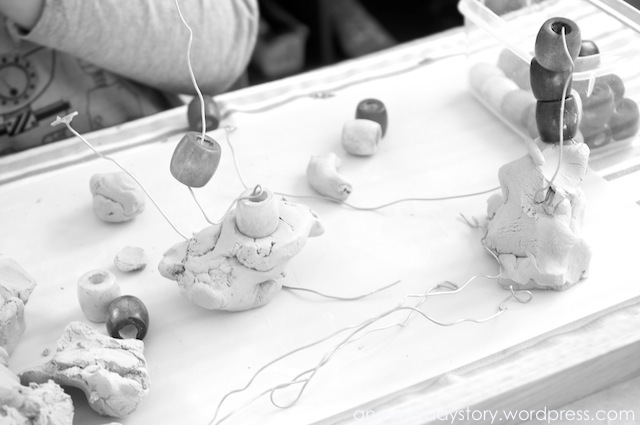 These little clay sculptures are some of the first Jack made. Using natural materials he mostly pushed clay onto the pinecone or the bark. Since then he has started to pinch off pieces and shape them before placing them together using wire, matchsticks or some other material. So, clay. Endless possibilities for creative expression. I bought ours from the local Potters’ Society for $5 for 5kgs! Cheap! I guess it is a little messier than playdough, but you’re right, nothing that won’t wash off. What a wonderful process-driven activity. Thank you for sharing this at the Weekly Kid’s Co-op. Great post! 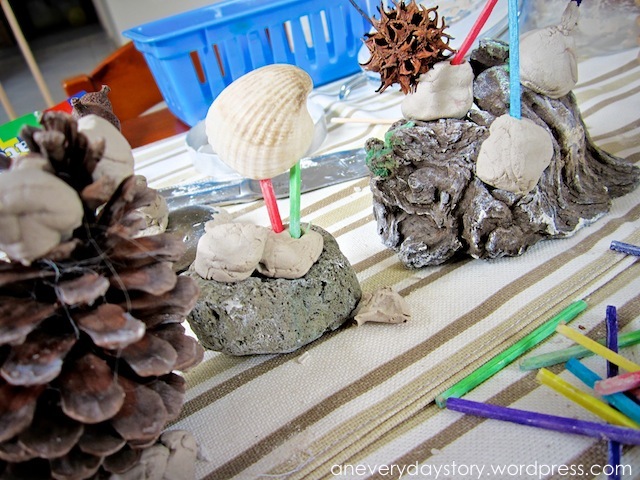 Do you have any suggestions for starting a Reggio Playgroup? Where are you? If you have a Reggio or Play-based early childhood centre nearby I would absolutely asking if you could have a look around. Otherwise, for me, Reggio-inspired means offering the children a range of art mediums and experiences focussing on exploring the medium rather than producing something, opportunities for open-ended pretend play and having on hand a range of interesting materials for children to explore freely. The books I have listed on the Reggio-inspired Books page are very helpful for ideas if you wanted to have a look at your local library. Thanks! I’m in the SF Bay Area and there’s at least one Reggio preschool I can tour. Our library doesn’t have the books you mentioned. Is there one really foundational one that you’d recommend buying first? I’ll continue to explore your site for playgroup ideas. I think the challenges there might be in introducing it to my already-established playgroup would be adding the new component to our usually unstructured get-togethers and setting up the space when I host the kids because we have a small apartment. Wow, I may have to make a trip into town to buy clay! I’ve been buying air drying clay for the kids from the major arts and crafts shops for waaaaaay more than that. And you’ve given me some ideas on where to go next with clay too. So far we’ve been moulding it with our hands, using natural materials to stick in/on the clay, then we moved onto using some basic clay tools, and this week i’ve given them a thick ’tile’ of clay to make impressions or for the older kids make clay shapes to go on top. I like the idea of multimedia sculptures with the wire and beads.